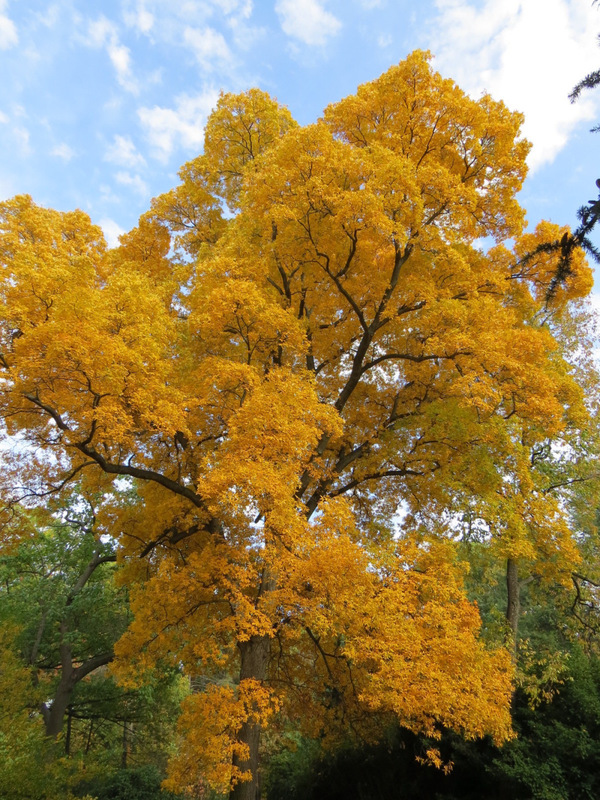 Carya glabra autumn foliage. Photo by Matthew Wills. licensed under a Creative Commons Attribution-Noncommercial-No Derivative Works 3.0 License. matthewwillis.com (Accessed 12/2017). 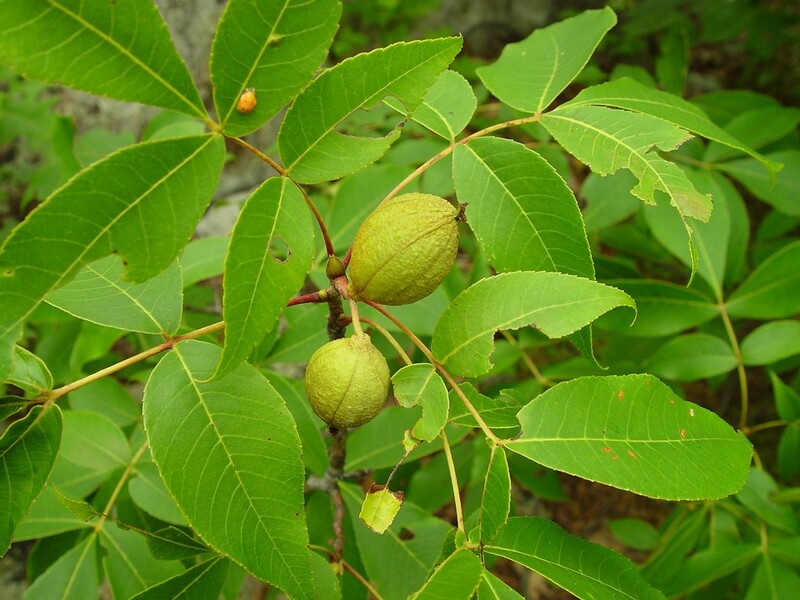 Carya glabra is a tree to 27 m, 90 cm dbh, slow growing; may live over 300 years; bark gray, tight, smooth ridged, patterned on younger trees, becoming furrowed, twigs hairless, slender, to 0.3 cm wide; growth pattern strictly determinate (Marks 1973; Gargiullo personal observation); deeply taprooted, roots associated with ectomycorrhizal fungi (Decker and Boerner 1997); terminal winter bud less than 1cm long, not much, if any wider than twig, outer scales gray-brown, dropping off in Autumn, inner scales pale gray, silky-hairy, overlapping. 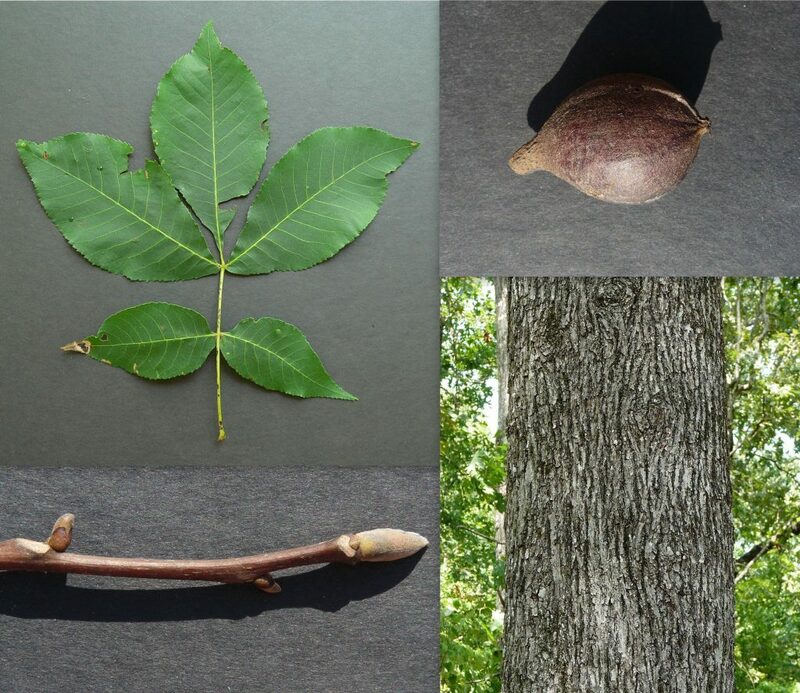 Carya glabra (pignut hickory) leaf, fruit, bark, bud..Richard & Teresa Ware .Georgia Botanical Society.gabotsoc.org (Accessed 12/2016). Leaves alternate, to 30 cm long, leaflets 5 (occasionally 7), terminal leaflet widest above middle, mostly hairless, margins toothed. Flowers monoecious, green, male flowers in dangling catkins, female flowers small, few, at ends of twigs, wind pollinated; blooms May. Carya glabra.fruit and leaves. By Arthur Haines. Copyright © 2016.gobotany-dev.herokuapp.com (Accessed12/2016). Fruit pear-shaped, to 3.5 cm, husk to 0.6 cm, unribbed, splitting to middle (Petrides 1988; Harlow 1946), Sept.-Oct. Seeds dispersed by mammals that bury nuts, must overwinter before germination will occur. Nuts eaten by many mammals and some birds: jays, crows, pheasants (Martin et al. 1951). Frequency in New York City: Occasional. Habitat: Undisturbed, upland moist to dry forests. Soil pH 4.8-7.5 (Hightshoe 1988; Gargiullo unpublished data). Moderately shade tolerant, index 4-6 (considered the most shade tolerant hickory). Tolerant of drought. Very intolerant of flooding. sensitive to salt, and soil compaction. Easily damaged by fire, (Burns and Honkala 1990; Johnson and Lyon 1991; Hightshoe 1988). Notes: Flowers, leaves and bark eaten by a few birds and mammals (Martin, et al., 1951). Some stump sprouting when cut. Diseases and insects same as those of C. cordiformis.